Miyuki matte beaded bracelet with a sterling silver frosted 6mm bead. Made to measure for the perfect fit. Unisex bracelet. Availability: In stock Size: N/A Categories: All Jewellery, Bangles, Mens Jewellery. Tags: bead bracelet, beaded bracelet, bespoke silver, custom made, handmade silver, jewellery designer, jewellery maker., liverpool, LWSilver, male bracelet, mens bracelet, mens jewellery, Miyuki, silversmith, sterling silver, uk, wirral. 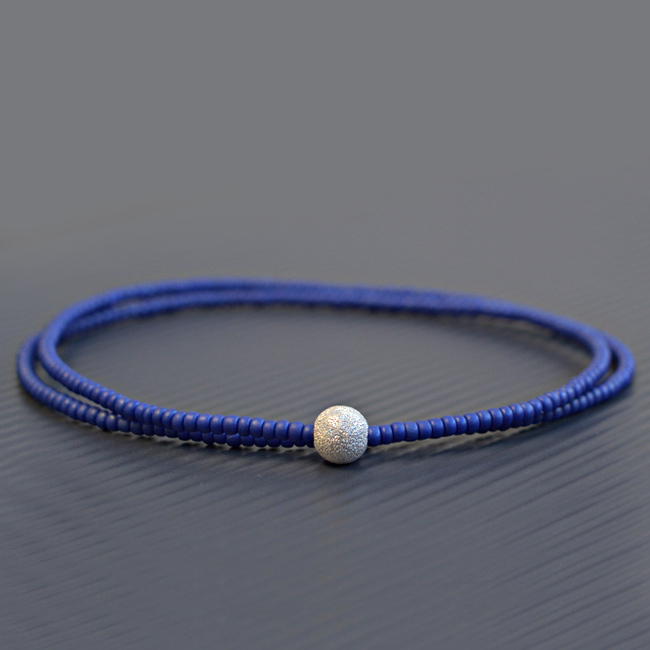 Miyuki blue matte beaded bracelet with a sterling silver frosted 6mm bead. The bracelet is wrapped around the wrist twice for a greater effect. Made to measure for the perfect fit. Materials: 925 sterling silver/Miyuki bead.